The human mouth is a fascinating but delicate part of human anatomy. Even if one tooth goes missing, you can face some significant oral health problems. Plus, no one wants to be the guy with the empty space in their grin. We want you to enjoy all the benefits of a healthy, attractive smile. One way in which we help our patients achieve this is through dental bridges in Abington. There are a few different types of dental bridges, but in all cases, the primary purpose is to “bridge” a gap in your smile. These prostheses work well for replacing one or more teeth. The most common type of bridge is the traditional sort, which has two crowns that fit over the abutment teeth (the teeth that are next to the gap in your mouth). A pontic, otherwise called an artificial tooth, is suspended between the two crowns. This type of bridge can be very attractive and long-lasting. You may also want to ask your dentist in Abington about an implant-supported bridge, in which the pontic(s) are supported by small titanium posts that get surgically placed into your jaw, rather than by abutment teeth. This type of bridge tends to be the strongest and longest-lasting. Your dentist will talk to you about your unique circumstances and recommend a restorative treatment that is the a good fit for you. What Advantages Do Dental Bridges Offer? Because bridges are usually made of porcelain, they tend to look very natural in the mouth. Onlookers won’t have to know that you’ve had any work done. A traditional bridge lasts an average of 10 years. If you care for it well and it doesn’t become the victim of any accidents, it could endure for even longer before it needs to be replaced. Whenever you are missing teeth, your remaining pearly whites are in danger of drifting out of place. A bridge may prevent this unfortunate situation. Bridges tend to be quite sturdy, allowing you to enjoy all of your favorite snacks and meals with minimal worry. 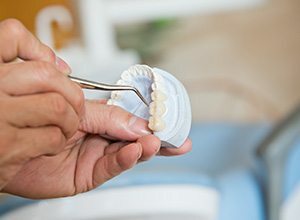 What Is the Process Like for Getting a Dental Bridge? The exact process for getting a dental bridge depends on the type of bridge that’s best for you. If you opt for a traditional bridge, the installation will take place over two or more visits to your dentist. During the first visit, the doctor will prepare your abutment teeth. We’ll have to remove a bit of enamel from them so there is room for the crowns. Then, we’ll take some impressions of the area, and that information will go to a laboratory, which will create your custom restoration. On your second visit, we’ll install your permanent bridge. We might recommend that you come back later for a few checkups so we can be sure that it works well with your bite and that all is well with your restored smile. If you’d like to learn more about dental bridges or schedule a consultation, please get in touch with us.